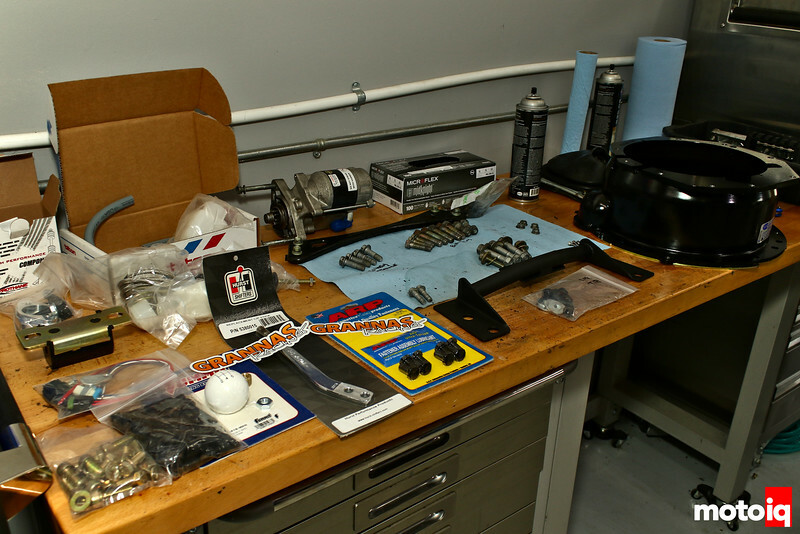 Project SC300 Road Racer: Part 18 – We have transmission! Our last outing with Project SC300 did not leave us all that happy. After much hard work completely rewiring the car, fabricating lots of odds and ends, and countless hours programming, we found the next weakest link in our chain — the transmission. There are quite a lot of options for replacing the Toyota W58 that’s found in the manual-equipped JZZ30 SC300. We decided to go Tremec by way of Grannas Racing, and here’s why. Of the Toyota options, another W58 would have been the easiest, and might have worked. Then again, it might not. It would be used, and old, and of unknown quality, if, at best, known mileage. Without cracking it open to look inside, its true condition would be unknown. While the gearing is good, there’s really not much in the way of upgrade or update components available. And, lastly, we were making practically double the torque of a factory SC300 with an NA 2JZ. Toyota never designed the W58 to take this kind of torque, so even a perfect one might not have much life to offer. A popular “upgrade” from the factory W58 in cars so-equipped is the R154 which was commonly found bolted up to 3rd generation Supras and other 1J/7M-powered cars. This transmission is known to take a beating. But they’re not available new, so we would be in the same boat as a used W58. Quality/condition would be unknown, although we would be “guaranteed” something that could handle the torque we were dealing with. Even given that, things like synchros eventually go and with a transmission this old options are becoming limited. In the R154’s favor is the fact that they are fairly common and are also popular with the Toyota off-road community, so companies like Martin Crawler have various upgrades and maintenance parts. Still, we didn’t really like this option. We wanted to get back on track quickly (and literally), and R154s weren’t exactly falling out of the sky. They also weren’t cheap, with one transmission and clutch combo looking haggard and ringing in at $2500 — before shipping. The venerable MKIV/JZA80 Toyota Supra came with the Getrag-manufactured V160. But, similar to the R154, these transmissions are getting old. You are also dealing with a transmission that was manufactured in relatively low volume (even compared to an R154) and you are paying an insane Supra tax. Used and beat V160s commonly ring in at over $3,000 and that just seemed silly. Plus, maintenance parts are rapidly becoming hard to find. Sure, it could handle the limited power we’re making easily, but at what cost? Since most Toyota options were ruled out, what other OEM choices were available? A common swap these days is the CD009 6-speed that was standard equipment on 6MT Nissan 350Zs. This is hailed as being a wonderful transmission to shift and use. But there are two big drawbacks to a 2JZ/CD009 combo. The first is the bellhousing. The only way to “adapt” a CD009 to other applications is generally to cut off the front of the bellhousing, since the CD009 does not use a multi-piece case. While you can buy CD009s from Nissan brand new relatively inexpensively, the idea of buying a new transmission just to hack it up to make it fit didn’t sit well with me. The process is well documented and there are even swap kits available for SC300+CD009, but I just wasn’t interested in the extra work. The other big letdown for the CD009 on an SC300 is the gearing. With an SC300 factory rear end of 4.08 combined with the CD009’s really short gearing, ultimate top speed was somewhat limited given the tire size we were running and our extremely conservative 6500RPM redline. Did we really think we were going to be going faster than 150MPH at most tracks? No, not at all. But what if we went somewhere like VIR with a straight that’s almost a mile? And Road Atlanta’s back straight is long, too. Sure, we could change the rear end ratio, and there are actually quite a lot of choices by mixing factory Toyota ring and pinions. But that means more time and more cost. No, there was still another option. A domestic option! Tremec’s T56 6-speed transmission has been used in just about every RWD American sports car out there. Mustang, Corvette, Firebird, Trans-Am, Viper and quite a few trucks, too. There are countless variants of the T56 and we could’ve gone junkyard hopping to find one that might work. But this is where Grannas Racing comes in. Joel Grannas has been in the drivetrain business for quite some time, and has engineered T56 swap kits for all manner of vehicles from Supras to IS300s to SC300s and more. He’s somewhat of an expert when it comes to this Tremec box. Grannas’ SC300 kit starts with a T56 Magnum transmission, specifically because this variant is built with replaceable bellhousings and is more or less a good length to go into most cars. The Magnum also has the highest torque capacity with no modifications from the Tremec factory, with a whopping 700ft.lb rating. This was way more than we ever expected to make in NASA’s ST-2 class, and we knew we’d be safe. Plus, if we wanted to go completely bananas, full sequential and straight-cut gear versions of the T56 Magnum are available — for a mere $20,000. Project R35 GT-R, Saving Weight With a Greddy Titanium Exhaust System! I T56 swapped my JZZ30 about 5 years ago. Definitely a far better option than going the R154 route as some parts for them are becoming almost impossible to get. Plus the option of going dog engagement down the track. I used the factory auto bell housing with an adaptor plate. Gearbox is tight, but just fits in the tunnel. I think from memory an obsolete bracket or 2 needs cutting off. And It can be removed and installed as a complete unit. It just requires a few wobble drive extensions. i would recommend that you loosen the motor mounts, and let the engine ’tilt back’, possibly by hanging a weight from it…then you can get to all the transmission bolts with the aforementioned wobble extensions…i’ve had 2 or 3 feet of wobble extensions, to reach the bolts, which looks ridiculous, but it works. The V160 would never have to be changed as the aftermarket could easily offer replacement parts including gearing but between the race to the bottom price mentality of the bulk of buyers and the upper-side greed of potential manufacturers it’ll die one of the best high power manuals that ever was! Shawn, you sound frustrated that I’ve chosen the T56 as opposed to the V160. Is that accurate? Or are you frustrated that there isn’t better aftermarket support for the V160? Would prefer V160 all day long but its a hose fest. Glad to see this option but its got to be plug and play. Was originally thinking the late Z unit but the info you’ve provided concerns me with the lack of plug and play for it. If you have a V160 equipped JZA80 then Grannas’ kits are going to bolt in with no issues. I have an early manual JZZ30/SC300, so there was some question about whether or not the trans tunnel was the same as the later year autos. You’ll see in the coming segments that in the end it wasn’t super difficult to make everything work on my JZZ30. Good to know as a fallback! Since V160 parts are still available, albeit rarer, I’m going to have mine rebuild. If all goes well on disassembly it should only need a 3rd gear syncho. Will have all the other weak items replaced with a complete REM polish of all components.